Barbados Today:-The island’s largest trade union is calling on workers to “rise up” and lead a revolution to drive positive change in the country and strengthen the union’s hands in the struggle for workers’ rights. 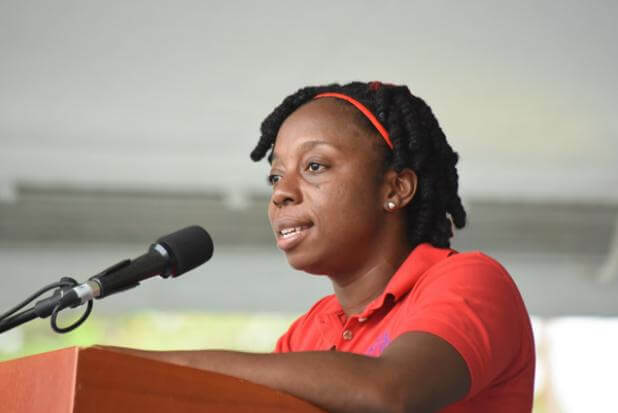 However, General Secretary of the Barbados Workers’ Union (BWU) Toni Moore is making it clear what she is proposing is not a violent overthrow of Government but “a revolution of our thinking” in an industrial relations climate that is full of negativity. “I would want to see our workers rise up a bit more . . . and I use that word cautiously because I am not looking for a revolution in the physical sense of the word. I am wishing for a revolution of our thinking,” Moore told her colleague, Assistant General Secretary Orlando Scott, in an interview recapping 2017, a copy of which was made available to Barbados TODAY. “That change will not necessarily come by us sitting down hoping that it comes, but we must be active in making sure that we are the change we want to see,” she added, echoing a speech by then American senator, Barrack Obama, after a nominating contest on February 5, 2008, to represent the Democratic party in the United States presidential elections. “Change will not come if we wait for some other person or if we wait for some other time . . . . We are the change that we seek,” Obama had told supporters. Moore gave notice that the BWU would intensify its fight for pay rises in 2018, as well as its efforts to tackle workplace violence. She said a common cry at a meeting last month of the International Trade Union Confederation (ITUC) was for salary increases for workers across the region and internationally. This, the union leader said, was no different to what is transpiring here, where public servants represented by the BWU are demanding a 15 per cent pay rise, while those represented by the National Union of Public Workers want a 23 per cent hike. “One thing came up [at the ITUC meeting] that is very consistent with what our members are calling for and what members throughout the region are calling for . . . the fact that workers need a pay rise. Our ITUC is really expecting that we would really follow through on its mandate to push for a pay rise for workers,” Moore said. “All over we are hearing people speaking about a widening of the gap where provision is being made for those at the top to maintain their status, but those in the middle and those at the bottom are the ones who are really suffering. What we are seeing in Barbados is what we are hearing complaints about in other places . . . we are seeing a middle class that has pretty much disappeared and a lower class that is getting larger,” she added. Moore warned a country as small as Barbados could not afford this level of disparity because of the threat of violence.
. . . and frustration that we are seeing manifesting itself in so many different forms. In a larger country when people start to vent, you don’t feel it as much as when it is so close and it is right on your doorsteps, sometimes literally,” the trade union leader suggested. Moore said both the International Labour Organization and the ITUC were concerned about increasing violence in the workplace, something she said was real and rampant here. However, she explained, the worst form of violence was not physical, but psychological. “What we are seeing in the organization more widespread is the psychological violence . . . and then we have people that we have to be creating opportunities for them to be counselled. And then these same people are being labelled as either finding excuses or being mad, which adds to the level of mental distress that many are facing,” the BWU boss said. you hear talk from the leaders about the investment in the tourist industry – yes, tourist come to visit (overnight) – however I have never seen the tourist buying anything – but maybe that is because I am short sighted.